What Are the Best Essential Oils for Immune Support? The dreaded time of year is finally here. Seasonal illnesses are making their way around the office and let’s not even think about what the kiddos are bringing home from school. Before you bathe yourself in hand sanitizer and keep everyone at a minimum safe distance, reach for essential oils as a natural way to support your immune system. 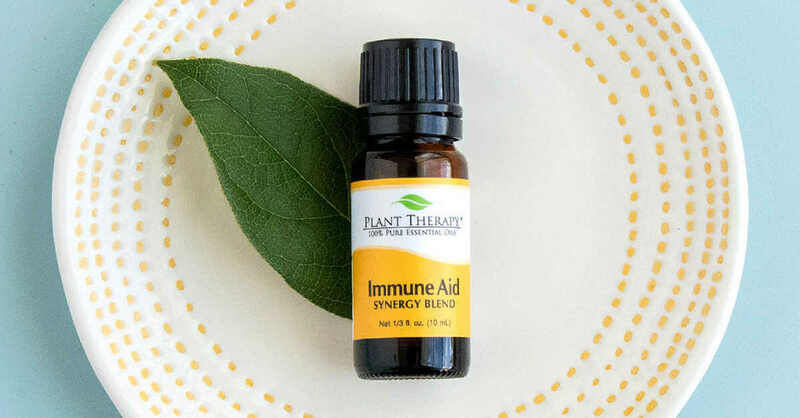 We’ve put together a list of the best essential oils and synergies you can use for immune support. 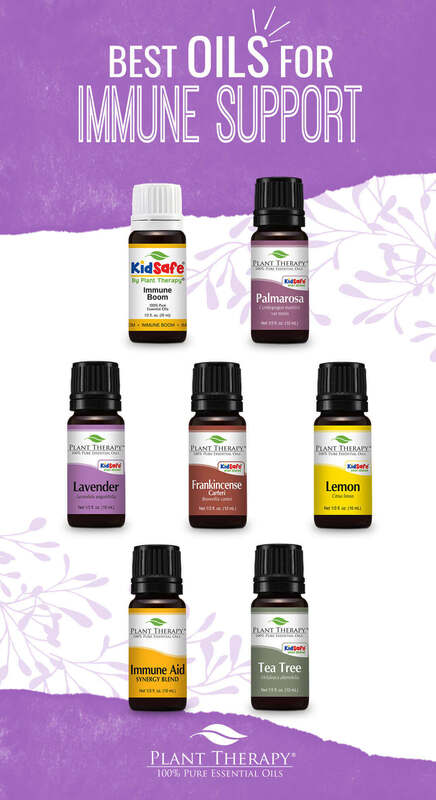 Even better, six of the seven oils are KidSafe, making them perfect choices for your whole family. One of our most popular KidSafe synergies, Immune Boom is designed specifically to bolster your immune system while being safe to diffuse around your little ones. Plus, it’s just as effective as Immune-Aid. Diffuse for 30 minutes on and 60 minutes off all day, or add to your favorite carrier lotion to apply topically. It’s also available in a pre-diluted roll-on for easy application. Another fantastic KidSafe essential oil, Palmarosa has a soft, green, and rosy floral scent. In addition to helping with seasonal illnesses, this oil can also help with digestive issues and balancing oily skin. This go-to essential oil well known for its relaxing properties. But did you know it helps with immune support? Lavender is truly a versatile oil! 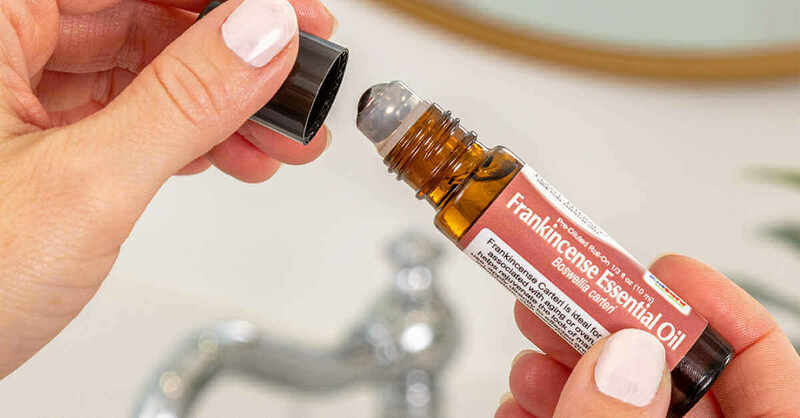 This variety of Frankincense has a green, balsamic, with lemon-wood aroma. Its association with the holidays is only icing on the cake for this exceptional oil. Add it to your skincare routine to help improve mature skin or add a few drops to your diffuser to take advantage of it’s immune boosting properties. 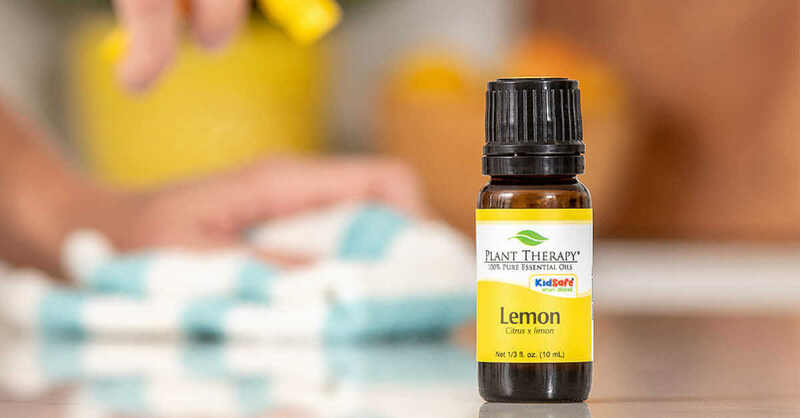 Lemon is well known for its fresh, zesty citrus scent. In addition to being invigorating, it’s well known to support a healthy immune system plus uplift and revitalize. It also is a great addition to cleaning solvents. 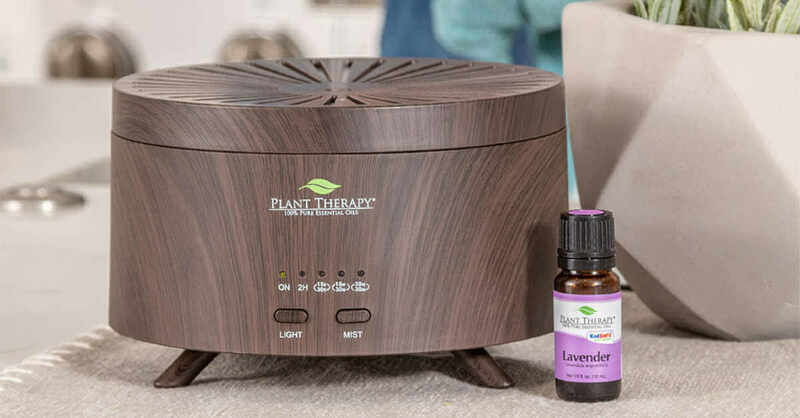 Take the guesswork out of diffusing the right oil with this popular synergy. It contains many of the oils on this list, making ideal to help maintain a healthy immune system. Consider mixing in a body care base or carrier oil and applying to the chest, neck, and throat in a 2% dilution. 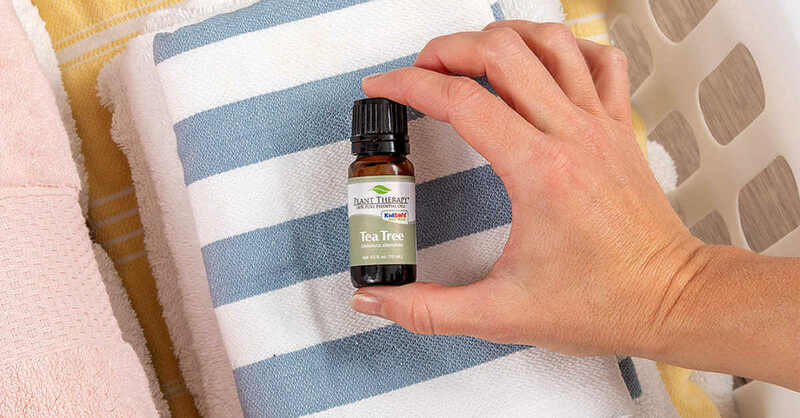 The final essential oil on our immune boosting list is Tea Tree Oil. Native to Australia, diffuse this oil to help clear the air and promote healthier air quality during times of seasonal illnesses. It’s fresh, medicinal, a green woodsy scent is sure to freshen up any room. THIS COMMENT IS EXACTLY WHAT I WAS LOOKING FOR!!! I heard there is a stomach bug going around and a couple of the moms I work with have been home with sick kiddos this week, so I made a “get here quick” order of Tummy All Better and Germ Destroyer! I had trouble deciding which oil to go with; Immune Boom or Germ Destroyer, and I feel like I did the right thing for our immediate concerns (as I’m sure we’ve already been exposed 🙁 ), but I definitely need to get some Immune Boom in my cart ASAP!!! Phew! Thanks for the info! Winter vomiting bug just hit our house (again)! Will diffuse and keep fingers crossed it doesn’t spread. We love your products! I have the kidsafe immune boom roll on. Where do you suggest the best place to apply would be? I put immune support on my feet every morning before I put my socks on. Keeps me well.. I just Palmarosa today and am excited to try blending it with ho wood, happy to hear it will help with immunity! Curious why Germ Fighter isn’t on the list! Can you help me out to know if Germ Fighter is still good to use for a immunity boost?! Good information! I already have all of these except immune aid! This is super helpful! I’m incorporating these oils in our routine to help stay healthy this winter! Havent been sick since we purchased Immune Aid and Immune Aid Roll On! I swear by these oils, life changing since I work with kids on a daily basis! Thank you so much for sharing, Caitlin! This is a great post, in fact I’ve printed it out. My daughter is having surgery in less than a month and we must do everything we can to stay healthy to ensure surgery goes as planned. I’ve now purchased most these EOs and added the rest to my wishlist. Thank you PT for the helpful blog posts!! I cant believe I just found this post. I am sensitive to citrus and I’ve been doing a lot of research and talking to customer service to find alternatives. It was great to read this post too and find some other singles I can make my own blend with! Have anyone tried Palmarosa? What different from other immune oil? Mind to share ? I can’t wait to receive my immune bloom oil to use on my daughter, she has been having a hard time fighting off bugs lately. Wow, I have and use all of these oils! Good to know that they are good immune support! My kids love Immune Boom, I look forward to trying some of the other ones for a change of smell. Great information and I already own most of these! Thanks for the info! I’m going to use what I have now and hopefully add to my immunity options soon! Great article. I’ve been using Immune Aid, but its awesome to know that others I already have also provide immune support. Had no idea lavender did this too. Great information to keep on deck, as cold and flu season is here in full swing! I love this article! My son and I both have compromised immune systems and get sick constantly! I’m happy to say that I have all but 1 of these oils (I don’t have Immune Aid, because I try to stick to kid safe oils),but I might just have to purchase it to use when I’m at work! Thank you, PT! Thanks for the reminder on immune support oils. There are so many good ones! Germ Destroyer has been a lifesaver recently. I will have to break out my Immune Aid to add to my rotation of immunity oils. My wish list is getting longer! Thanks for sharing. I knew about some of these, but not others! Great article, as a teacher of young kids I will definitely need to bookmark this info! I didn’t realize that a few of these had immune properties. Great to know! I love the educational information you include on your website and always refer my friends over her to read up. immune aid and immune bloom are probably the reason I have not been sick during my student teaching placements! I diffuse at my home 2x a week for 30 minutes, and after days when I was exposed to some extra germs! Me and my wife have been sick for like 2 weeks. Palmarosa has been helping her fall asleep at night. i have been sick so many times in the last few months… i think its time to get immune aid immune boom and palmarosa! Yes! I just got Palmarosa in my latest order so I now have all of the singles identified in this post. I will be alternating these with the Germ Fighter oils in my diffuser over the next few months. Thank you for this timely post. Immune Boom is where it’s at! I like to alternate it with Germ Destroyer. And Tea Tree is probably the most versatile oil I own. I can find a use for it for just about anything. This is great info! Thanks! I have almost all of these oils and love them all. I just go immune aid and started using it yesterday. I love it it smells so good! I got it in the convenient roller bottle. I love those things they’re so handy and ready to go. Takes the guesswork out. We have most of these, but the frankincense is serrata. Will that work? Great Info coming into cold and flu season! Palma Rosa sounds lovely! Thanks for the reminder which ones will support our immune systems. Already starting to get the sniffles, so I’ll be kidding up some concoctions today! perfect timing for this post! we’ve all been fighting the yucks and I came to the blog specifically to look up what to use… and you are one step ahead. Thanks so much! I had no idea that Lavender oil would help with immune support. I’ll be moving this oil up on my wish list. Love the immune aid, may have to order the Palmorosa just to give it a try. Thank you so much for this! Now I know what to do with the Palmarosa that I accidentally bought two bottles of! I love that I have 6 of the oils mentioned above… need to get immune boom soon for the little one. This is great info for the up coming “sick” season. I love PT oils!! I love frankincense carteri! Awesome that it made the list! Just in time for flu season. Thanks PT for such great info. I’ve been using frankincense f. For immune boosting. Is carteri better for that? Great info, I’ll have to try the immune aid soon. Great information. I did not know lavender was used for immune system support! I was thrilled to get on the website tonight and read this blog. It is much needed for this time of year. I have been diffusing immune aid for days now as a virus has hit our house over thanksgiving. I’ve added lemon and lavender in the kids room! This is such a needed blog post this time of year! Almost as soon as it started getting cold this year we started getting a few “small” sicknesses. yuck! Nice reminder to up my oily game. I’ve been switching around between the immune boom, sniffle stopper, and germ destroyer depending on what everyone in the house is feeling like and so far things are going well! Immune aid was a lifesaver when one of the family got sick on a 2 week road trip! The rest of us stayed well using this daily! Lemon and Tea Tree have been on my want list for awhile but now Palmarosa will be added. clean, god smelling immune support is one of the main reasons I am starting my journey into oils! I love Immune Aid! When the sicknesses start going around, I diffuse this in the living room and the van. We’re around a lot of people in Nov/Dec and rarely get sick. I just got my kid safe set the other day. My family has been passing around a cold for the better part of a month. Hopefully immune boom and germ destroyer will help us get over it finally! Thanks for the tips. I didn’t know about Palmarosa. Great and informative! I have been diffusing Immune Aid when going to bed. Love Plant Therapy! Timely information! I will have to order some Immune Aid! I need to try Immune Aide. We have the immune boom for our kiddo. I should also try some Frankincense. This is great information! This is very useful information, thank you Plant Therapy. I’m new to oils and have a few of these that I haven’t yet gotten to use, but tis the season for needing immune support! Palmarosa is getting added to cart now! I love Frankincense. Maybe I should try Frankincense Carteri. I love that I have most all of these oils or that they are on the way in my recent orders (in addition to my first diffuser that is coming today). Immune support is one of the main reasons I have been diving into oils! I love immune aid, we haven’t been sick a single time since using this oil!